Product #846 | SKU BEC1U | 4.0 (based on 1 rating) Thanks for your rating! The C-1U is a digital home recording or podcasting enthusiast’s dream come true. This professional quality condenser microphone is identical to the acclaimed BEHRINGER C-1 mic with one awesome difference: it’s has a built-in USB interface so you can be ready to record faster than ever, and with minimal preparation and equipment. Just plug it into your computer and start recording! The primary type of microphone used in recording studios and radio stations, condenser microphones are the ideal choice for capturing vocals and acoustic instruments. Unlike a dynamic microphone, a condenser microphone collects sound from throughout an environment such as a room, rather than only picking up what’s happening directly in front of it. It is capable of capturing much more detail with a wider, flatter frequency response. Trouble is, conventional condenser microphones aren’t made to interface with a computer — you have to provide a microphone preamplifier and an analog to USB interface. The C-1U has a built-in USB interface that derives the needed power directly from your computer’s USB input and requires no special drivers. Just plug in and start recording your masterpiece! The short answer is no. Unlike most other USB microphones, you won’t need to download any additional drivers to begin using the C-1U right out of the box—it even works with Vista! You also get an extensive software package with Audacity for recording, Kristal Audio Engine for editing and multitracking, Podifier uploading software and PodNova downloading software. It works like this: Connect the mic to your PC or Mac. Load Audacity and save your recording onto your hard drive. Now load the included Kristal software and you can edit your recording or add tracks. Now you’re ready to upload your work onto the Web via Podifier. 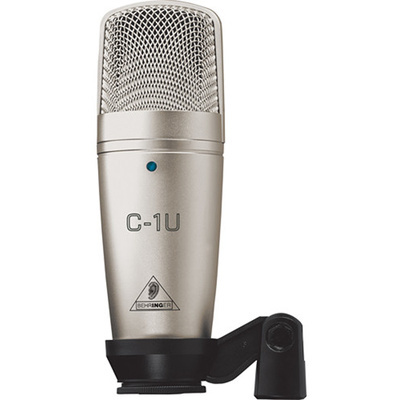 Getting started with the C-1U may seem like child’s play, but this pro-caliber microphone is anything but a toy. It has an exceptionally flat frequency response and pristine sonic resolution that ensures content-rich audio that is as natural sounding as the original source. The cardioid pickup pattern provides unparalleled sound source separation and feedback rejection. The C-1U’s ultra low-noise, transformerless FET input circuitry can handle extreme dynamics, all the way up to 136 dB, with ruler-flat frequency response from 40 Hz to 20 kHz. That means that even if the special guest on your next podcast happens to be a revved-up jet engine, this workhorse mic will not distort! * Alternative driver for all BEHRINGER USB audio hardware (including C-1U) – except BCD2000!